For nearly the past week, the entire Pacific Northwest has been given a heat advisory. Coming from Ontario where the summers are hot and muggy, this advisory – where temperatures got up to just over 30° C (aka 86° F), is almost laughable. But living in Vancouver for 17 years now, I’ve begun to learn it’s peculiarities. I’ve adapted to this moderate climate where it’s rare to find anyone with icy air conditioning and when it snows, the city turns to panic. So like a born and bred Vancouverite, I’m melting. Go ahead and laugh, we’re weather wimps. Yet, I love the sunshine and the breeze and I’ll take the mugginess if it means no rain and clear blue skies for grey clouds. I’m thrilled, weather warnings be damned. All the heat means it’s salad time. 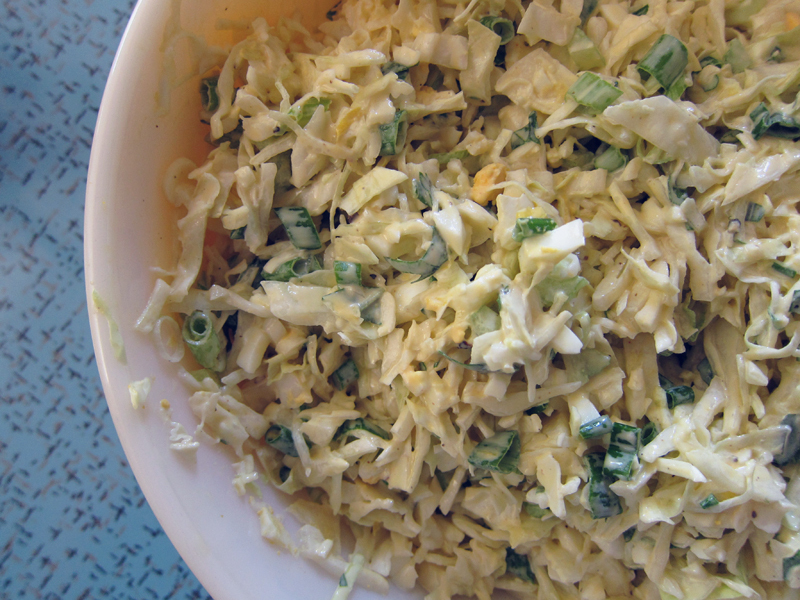 I made this slaw for a Canada Day barbecue that we had this past long weekend with some friends and it got rave reviews. 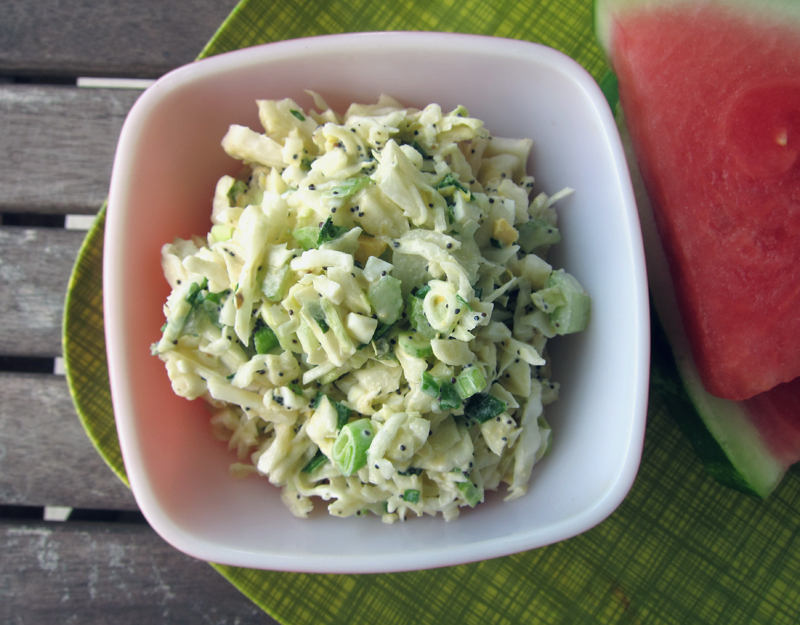 It’s different because of the addition of hard boiled eggs which makes for a distinctly creamy slaw along with poppy seeds for a refreshing crunch. It’s a mayo based dressing and while I usually favour vinegar based vinaigrettes, I decided to play along. I did cut the amount of mayonnaise with some greek yogurt for extra tang and as a back-up, in went some cider vinegar along with some lemon zest. It was a very good move. This is a very comforting and down-home kind of coleslaw, the perfect thing to share at your next friendly summer gathering. Eat outdoors and have a cold drink nearby. Add the finely sliced cabbage, along with the green onions, celery, eggs, lemon zest, basil and parsley into a large bowl. 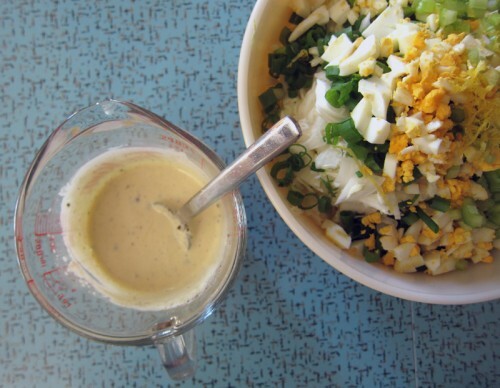 In a measuring cup, mix together the dijon, mayonnaise, vinegar, paprika, honey and salt & pepper. Taste & adjust seasoning, if necessary. 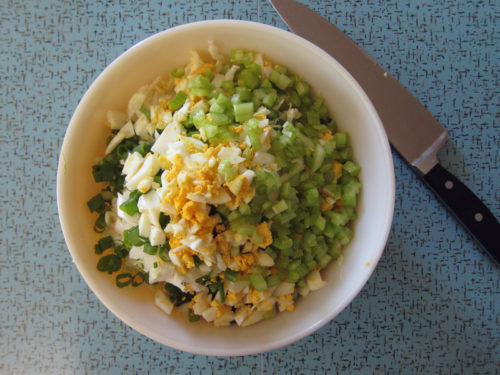 Toss the slaw together with the dressing and then add in the poppy seeds and toss again. Serve immediately. Keep refrigerated for up to 3 days. I love poppy seeds in my slaw, but I’ve never seen hard boiled eggs before. I’m diggin’ it. This would be awesome on basically any sandwich, I bet. Looks like a great salad. I like the idea of mixing in Greek yoghurt and poppy seeds are just lovely in salads. I totally understand your feelings about the weather, as a British girl we are pretty obsessed with our weather, mainly because it’s so dreadful. I hear there is sun coming for the weekend so this salad would be perfect! People can be so funny when it comes to heat and snow! Glad to hear you’re surviving the heat wave. 😛 This slaw sounds super tasty! Caz, here too! It’s rainy quite often, but we’ve got a nice good stretch of heat and sunshine, so I’ll take it. Happy sunny days to you too! I know you chop up your own cabbage and I’m embarrassed to say that I don’t. I buy the pre-chopped bags of slaw. Okay, now that I got that out of the way, let me say that adding boiled egg to cabbage is sheer brilliance! And basil too! … So interesting! Joanne, you could totally use those pre-chopped bags – I don’t judge! The egg works well 🙂 Enjoy!